For collectors the beauty of Royal Doulton is the diversity of its wares. When it comes to collecting tobacco jars this statement is particularly pertinent! 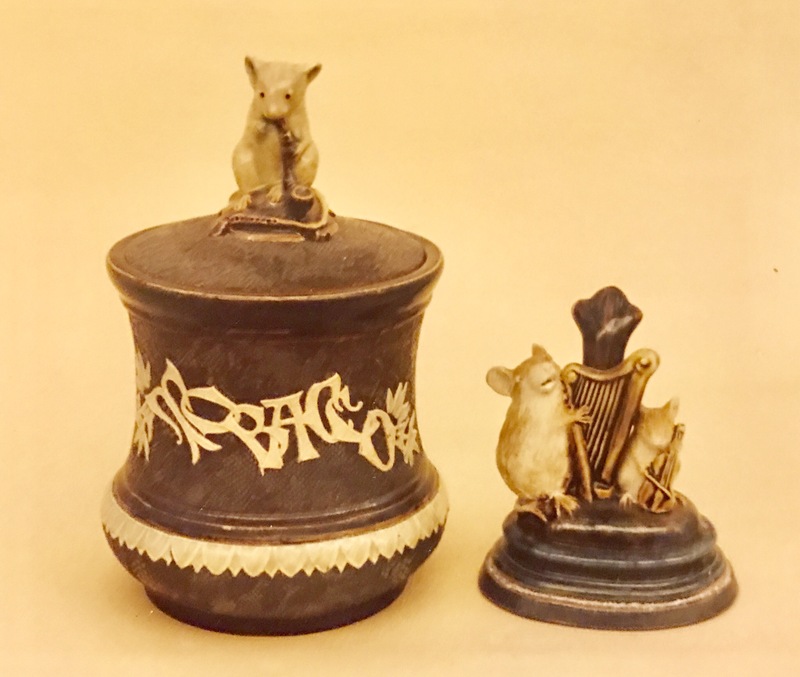 Tinworth designed tobacco jar and a Tinworth menu holder c.1885. Whether you prefer the products of the Lambeth factory or the pottery examples from their Staffordshire factories – there is something to suit every collector. Four Lambeth examples: Chiné, simulated metal, Silicon and an art nouveau example. 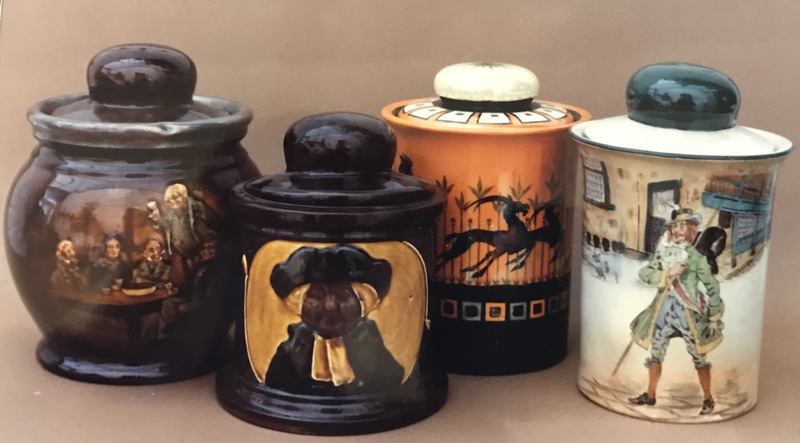 Lambeth examples can be found by leading artists including the legendary George Tinworth, to repeat designs created by leading in-house artists, to more mass produced examples including Doulton’s famous Chiné technique. Rare novelty examples also exist such as the one illustrated modelled as a weight! Burslem examples: two Kingsware jars featuring Mr Pickwick and Parson Brown, a Reco Capey example and a seriesware Barnaby Rudge piece. Pottery examples from Burslem typically fit into the following categories: art wares, Kingsware or seriesware as can be seen above. 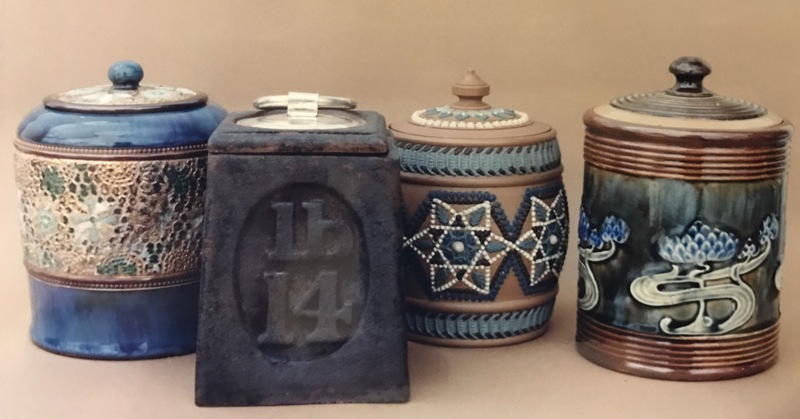 Collecting tobacciana is a worldwide phenomenon so it is no surprise to see rare examples fetch high prices but a collection can be assembled of more modest varieties of Doulton wares such as the Chiné or Silicon examples above.